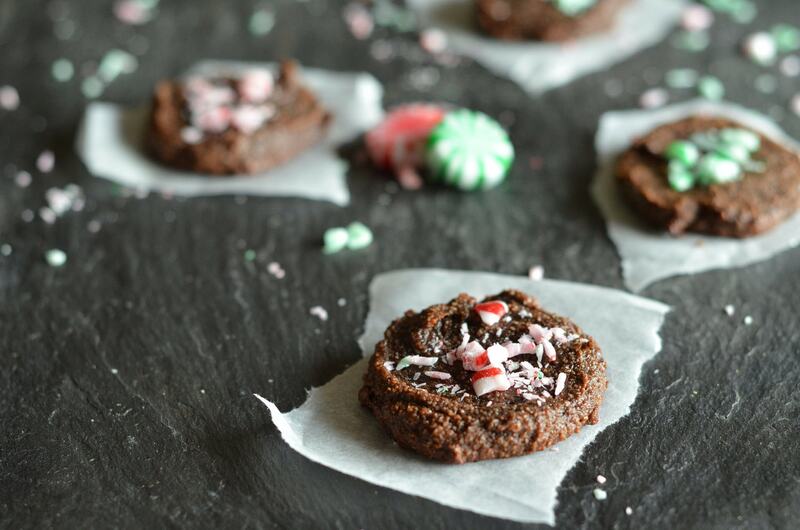 This cookie recipe is part of the 2018 Bariatric Foodie No-Flour, Sugar-Free Cookie Collection, sponsored by Sola. Click here to get back to the full collection. This recipe was a bit of an adventure. To describe it sounds like that Dr. Seuss classic, Green Eggs and Ham. Well, maybe not all that but I did try these cookies a few different ways. I tried them with butter as the fat. Then, I got the idea to try them with avocado as the fat. I tried them with xanthan gum (which is supposed to replicate the texture of a cookie with gluten). I tried them without. I tried them with Splenda. And I tied them with Sola. I’ve made this cookie recipe many, many, many times! The recipe you’re getting today is my personal favorite, but I’ll let you know of some alternatives along the way. So let’s dive in! So this cookie all starts with an avocado. Yep…an avocado. I’ve read about subbing avocado in chocolate stuff and I was dubious. Would I really not be able to taste it? Like reallllllly? But my mantra is, “play with your food” so I decided to give it a whirl. Just to see what happens. Spoiler alert: I didn’t taste it. At all. Tip #1: Use a really, really, really, really, really ripe avocado. Like squeeze it. Is it squishy? Then that’s the one you want! Don’t worry if it has dark spots on the flesh. We can work with that. But the riper the avocado, the softer it is, and the easier it is to mash. Which brings me to my next point. Tip #2: Use a hand (or stand) mixer. You can mash avocado with a fork, yes, but if you don’t want to know it’s there? You need to mix it realllllly well. A mixer makes easy work of it and it’s quick! Ok, back to business. There’s one other source of fat in this cookie, by way of half an egg. Yes that’s weird but use Egg Beaters and make it easy on yourself! 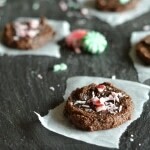 There’s three flavors going on in this cookie: peppermint, chocolate and coffee (collectively known as mocha). Only two are going inside the cookie, one goes on top. To achieve a mocha flavor, I used a combination of baking cocoa, Sola sweetener, and a little bit of good instant coffee. You may ask “what’s good instant coffee?” In my world, that just means it didn’t come from the dollar store. Use whatever you like. Decaf or regular. The key is not to overdo it. Since we’re using baking cocoa, that’s already one bitter ingredient. While coffee makes chocolate taste more chocolatey, too much and it’s all just a bunch of bitter! The ratios in the recipe below are a good starting point. Tweak to your liking! Pro-Tip: Taste the dough before you bake the cookie. It tastes pretty much as sweet as it will baked up so if isn’t sweet enough for your liking (or is too bitter) you can adjust! You’d adjust the sweetness simply by adding more sweetener. I’d suggest by the teaspoonful until it gets to where you want it. That will usually offset the bitterness as well. The peppermint part comes in at the end. My local Dollar Tree sells sugar-free peppermint candies (and spearmint). I simply buy a bag, put them in a baggie, and go at them with my French rolling pin until they are crumbly. Then I top all sorts of things with them! Whereas the cookie is very chewy, the candy is crunchy, so it makes for a nice combo, I think. The only real thing I have to say about texture is a cautionary note. I usually am not too bossy about how strictly you follow my recipes, but the first time you make these cookies, try to follow my recipe to the letter! Downsizing cookie recipes is not easy! Once you get a feel for the recipe, go crazy with it. Oh also…I tried using xanthan gum in the cookies. Xanthan gum is used in a lot of gluten-free recipes to mimic the texture of baked things made with all-purpose flour. But they produced a bit of a gummy texture. At first, I thought it was fudgy, but no. It was gummy. Which I didn’t care for. I can deal with a cakey cookie. A gummy cookie? No way! Like I said of the full collection. I’ve never gotten crispy cookies with almond flour (I’m sure it’s possible but I’ve just never gotten that, especially because I try not to use too much butter, etc.) So they will be a bit cakey, which I don’t mind! But seriously…don’t use the xanthan gum. I’ve warned you…twice! While the avocado worked well and did not show up visually in the final cookie, I personally liked the flavor of these cookies better with butter. But, at a point, you gotta give heart health a chance! I updated this recipe with a range for the sweetener. If you prefer a very lightly sweetened cookie, go with the lower end of the range. If you want a little bit of a sweeter cookie go for the top! But, as I said before, taste the dough before you bake it. If it’s not sweet enough for you, add a little bit more sweetener, a teaspoon at a time until it gets where you want it to be. 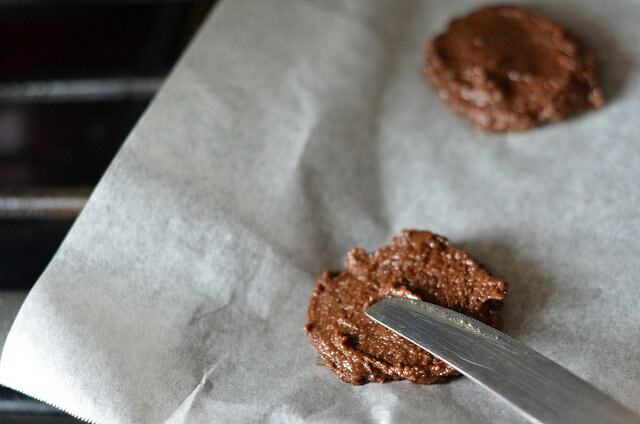 With chocolate cookies, it’s really easy to burn them because you can’t check the edges for browning. My general baking rule is when you really begin to be able to smell them, you need to go check on those suckers. They will be soft coming out of the oven but if you let them cool for a few minutes on the cookie sheet before transferring to a cooling rack, they’ll do what they need to do! Don’t overdo it with the coffee. I did that in one batch and, much as it hurt my heart to do it, I had to toss it! Don’t use the xanthan gum. It didn’t really do anything but make the cookie gummy. Well. Unless you like gummy cookies. In which case, rock on! In a bowl, combine almond flour, baking powder, salt, cocoa and instant coffee and stir well. Set aside. In another bowl, mix avocado and sweetener, preferably with a hand mixer to work out the lumps in the avocado. After fully combined, add egg and vanilla. Combine wet and dry ingredients and mix thoroughly, being careful to work out any lumps in the almond flour. Consistency should be of a soft cookie dough. If it is more like cake batter, add another tablespoon of almond flour and mix well before refrigerating for 30 minutes. Drop spoonfuls of dough into two rows on your cookie sheet, then flatten the dough with a spoon to form a disc. Bake for 12 minutes, then remove from the oven and allow cookies to cool on the cookie rack for 5 minutes, before transferring to a cooling rack. Good tips! What sweetener did you use? I used Sola and I found 3 tbsp to be SWEET for this recipe (for my tastes – that’s one reason I often recommend folks taste as they go so you can adjust) but I imagine other sweeteners would be different. Unfortunately I’ve not made an almond flour cookie yet that’s as crisp as ones with white flour/sugar but it’s sort of a trade-off. That’s one reason I’m glad these are small batch. That way you didn’t put hours and lots of ingredients into it if it isn’t your cup of tea!